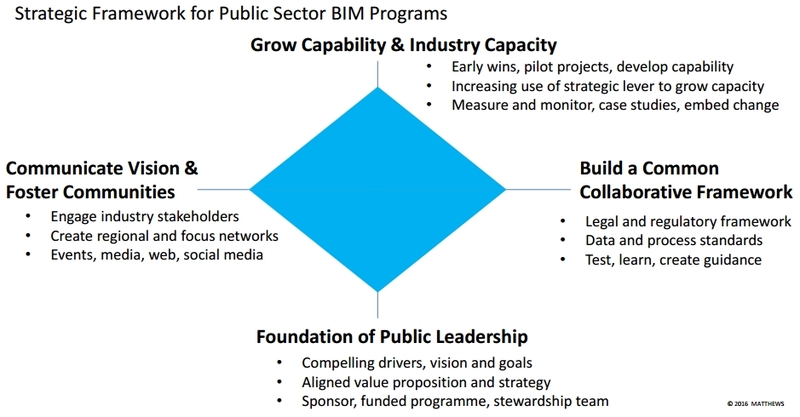 Public leadership – is there a clear vision, an aligned value proposition and strategy, and a sponsor funded to steward the BIM programme? Connected communities – are industry stakeholders, via regional and sectoral networks, engaged and connected? Industry capability – is there a programme of pilot projects to develop capability, demonstrate measurable benefits, and become exemplars for wider strategic industry adoption? Collaborative framework – is a legal and regulatory framework being created, incorporating data and process standards that can be tested and refined to provide guidance?